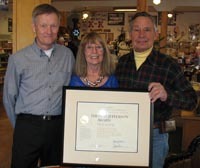 Photo courtesy of the National Weather Service National Weather Service representative Gary Wicklund, left, present the Thomas Jefferson Award for outstanding volunteer weather observation to Picabo rancher Nick Purdy, right, and his wife, Sharon. Picabo rancher Nick Purdy was awarded the National Weather Service’s Thomas Jefferson Award last week, honoring more than 43 years of continuous weather observations. Purdy, the owner of Picabo Livestock, began recording weather and climate observations as a volunteer weather observer at Picabo, seven miles west of Carey, on Nov. 1, 1969. He said he took over observations from his father, Bud Purdy, in 1969. Another local, Chuck Atkinson of Atkinsons’ Markets, had started the observations originally. Atkinson passed the reins to Bud Purdy in 1964. “Everybody ought to do some community service, and I guess that’s mine,” Purdy said. The Thomas Jefferson Award is the National Weather Service’s most prestigious award, presented to only five weather observers from around the country each year. The award is so named because Thomas Jefferson maintained an almost unbroken record of weather observations from 1776 to 1816. Purdy is one of 11,000 volunteer observers nationwide. Weather observers are responsible for recording daily weather conditions such as temperature and precipitation, as well as supplemental information on snow depth, river levels and soil temperature. Purdy also served as a storm spotter, giving the agency information about storms in the area. Purdy’s observations have been used by the U.S. Bureau of Reclamation, the U.S. Geological Survey and the National Resource Conservation Service to evaluate water supply for the Big and Little Wood River hydrological basins. “Mr. Purdy’s flawless and informative observations have been instrumental in providing the National Weather Service with critical weather information,” said Gary Wicklund, head of the observer program. This is Purdy’s second honor from the agency. He was the recipient of the John Campanius Holm Award in 1997, the agency’s second-highest award. John Campanius Holm recorded the earliest known weather observations in the United States in 1644 and 1655. Purdy said that in the aftermath of the award, he’s likely to take a step back from weather observing, moving the station to the Silver Creek Convenience Store in Picabo, which he owns. He said the store’s staff would contribute to the records and keep making note of daily weather conditions. “I will still work at it, and we’ll keep it going,” he said. When asked how he felt about the award, he chuckled. “I would rather have had a check,” he said.